PRINCETON, FL – December 21, 2012 – TWN Industries Inc, the world’s premier provider of Water Transfer Printing film, equipment and supplies, is proud to announce the release of Orion Design Group’s first pattern in water transfer printing film. This pattern, Lupus, is a new design of tactical and hunting camouflage that will give any user stealth-like concealment in the field. Orion Design Group is a brand born and bred in the mountains of Wyoming. With over 50+ years of combined experience in the tactical, outdoor and hunting communities, Orion Design Group embodies the mountain lifestyle. Orion Design Group is dedicated to providing gear and patterns with the look, durability and dependability needed to accomplish your mission. Regardless of whether you are on a patrol near the Pakistani border, battling the crux of a brutal climb or pursuing elk above timberline, Orion Design Group has you covered. The Lupus concealment pattern is their flagship design. Lupus was created to excel in a variety of environments. Utilizing proprietary Pattern Fusion Technology and Ghost Mimicry, Orion Design Group brought Lupus to life with one theory in mind – to make the user as stealthy as possible. Regardless of light conditions, environment, or range to target, Lupus will provide the concealment necessary to successfully take down your prey. 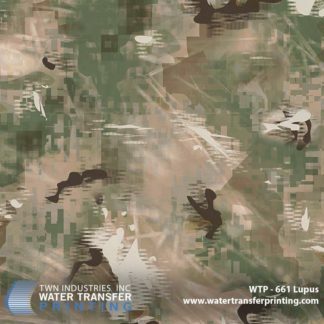 Lupus water transfer printing film is available exclusively through TWN Industries, Inc. Film is available for immediate shipment. The part number for Lupus is WTP-661. To find a TWN Certified Decorator to decorate products for you or to purchase film call us at 305-258-9622.